There is no doubt: Yasiel Puig will win the 2013 All-Star Game Final Vote campaign. There you have it. Sure, MLB will tell us that Freddie Freeman is leading the vote. Really, Freeman is. But there's no public oversight or audit of this count, and MLB has every every incentive to lie. They want the headlines that have percolated due to this "controversy." But in fact, Puig's victory is pre-ordained. Puig generated 842,915 write-in votes during the original All-Star Game balloting, which was the most write in votes since Freddy Sanchez got 850K write-in votes in 2006. (Sanchez made the team in 2006, as well as 2007 and 2009.) Puig has the insane following by quantitative count, and unlike the other candidates, has true national appeal coast-to-coast. Freeman is indeed a valid and worthy candidate for All-Star Game inclusion. But there's no way MLB will let Puig lose this. 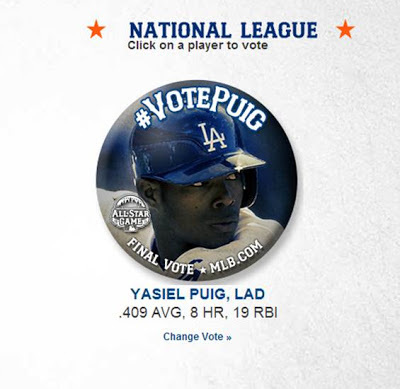 Heck, even Adrian Gonzalez, another worthy All-Star Game candidate, has thrown his support behind Puig. I heard they will be counting chads in Florida. Haven't seen thunder thighs in a while. Gonzalez on the ballot is splitting the Dodger vote, even with A-Gon'z endorsement. 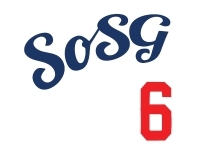 It was a genius move by the assholes that want Puig out of the game. Oh great, now we know that Gnomes is really Nate Silver.